All startup teams need help. The good news is that there is no shortage of “startup mentors” out there. The bad news is that there is no shortage of “startup mentors” out there. How you recruit and work with your advisors is critical as the right advisors managed properly can really have a powerful impact on your business. You need to find advisors who can augment your team with skills, experience, and connections. If you are all PhDs in astrophysics and are building a related startup, you don’t need the head of your University’s Physics department or even a Nobel winning Physics on your advisory team. You will need some people with business and fundraising experience. Also, don’t try to go get famous people to be an advisor; I know that Mark Zuckerberg is not meeting with you monthly and won’t add much value except for the coolness factor. The good news is that there are a ton of people out there willing to give you advice. The challenge is keeping the advisors engaged. Your advisors mean well and want to help, but they are busy people. You need to set the expectations up front as to what kind of advice you need and how often you will be asking for it. If you don’t have this conversation with your advisor, you run the risk of some very misaligned expectations, leading to a bad experience for both sides. Typically for companies that I advise, we usually have a call once month or every six weeks. But when something comes up that I am uniquely qualified for, the frequency is higher. You also need to formalize your relationship with you advisors! This is important for several reasons, but the first is legal liability. If overnight your company is worth billions and your advisors have been informally advising you without a contract, they may think that they are due a large stake in your company and sue. Another reason to formalize your advisor’s relationships is that by formalizing it, they will take the relationship more seriously. So many companies ask me to advise them, but the ones I say yes to and have a formal agreement with, I feel more obligated to make the time for. An easy way to lock down an advisor is to use one of the standard Advisor Contracts. I have used this one several times. Lastly, you need to compensate the advisors in order to keep them engaged. If your advisors want a huge chunk of your company or a salary or stipend, they are not the advisors for you. Use the following matrix to determine how much to compensate the advisor with. First determine what stage your company is at: idea, startup, or growth. Idea is usually pre-seed, startup is usually Seed stage, and Growth is typically a Series A or later. (I explain the stages of funding here.) This is important due to the amount of risk your advisor is taking. 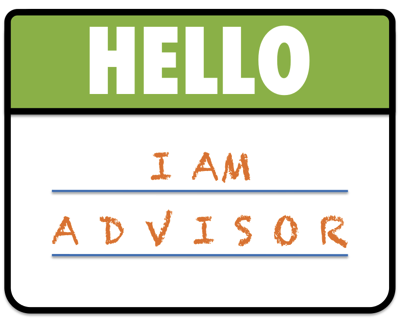 Then determine what kind of advisor you are signing up: Standard, Strategic, or Expert. I know that these are kind of vague, but they usually line up pretty easily. Make a proposal and then use the equity number in the box. This should be a standard and non-negotiable. If the advisor tries to negotiate away from these numbers, don’t have them as an advisor. They should not be in it for the money/equity, the compensation is more of a “nice to have.” They should be advising you because they want to. Lastly, have a vesting schedule and a way to easily remove the advisor. Typically you have an advisor for a year or two, depending on the need of your team. For example, if you lack a technical team at the idea stage and engage with an advisor who is very technical and expected to help you recruit and hire an CTO within a year, you probably only need to sign that advisor up for a year or two. Then make room for other advisors in other domain areas. 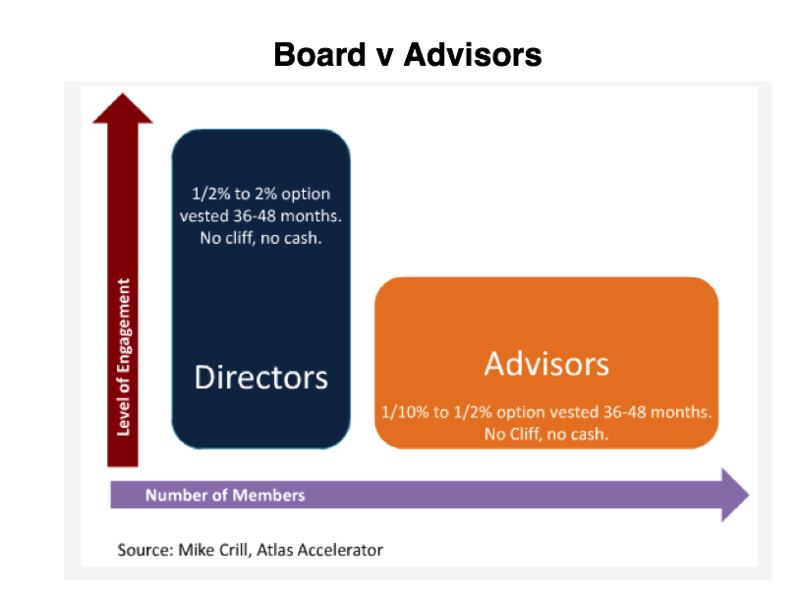 What is the relationship between a Board of Directors (BOD) and your advisors? Nothing. More importantly, your board members are responsible for the governance of the company and legally liable for its execution, while your advisors are responsible for nothing and legally liable for nothing. Your directors have high engagement, often meeting in person several times a year. Your advisors are less engaged and often engaged via email and Skype. You should update your advisors (and investors) with a bi-weekly or monthly email: explain the good, the bad, the ugly since the last email communication. At the end of the email put in the ask, or what you want your advirosrs to pay attention to or what you need from them. While your advisors may only skim over the updates as they come in, at your next call, the advisors can review those emails before the call and make the call more efficient. You won’t have to spend the first 10 minutes of the call updating the advisor on what happened over the past month. I love getting these emails, it shows me that the companies that I advise are organized and understand proper time management. What was my experience like? Some companies rarely contacted me. Some contacted me randomly, usually when they needed some specific advice. Other’s scheduled a regular phone call. I’ve done it all: lots of general strategy, accelerator application advice, fundraising tips, team compensation, interviewing CTO candidates, make introductions, M&A advice, and sitting in-between founder breakups. Some of my companies have had exits, sometimes the money from my shares was great; one exit was small and paid for an awesome dinner and night out with the team. One company I advise recently shut down and I helped the founder find a new gig. All my experiences were worth the time I put in and lots of fun. Lastly, I learned a lot advising, as much as I taught the founders! Only five years ago, getting into and completing an accelerator program was something special. That was when there were only a handful of Accelerators worldwide and the program, mentorship, and opportunity for follow on funding was huge. Today there are literally thousands of accelerators out there, diluting your experience, unless you go to one of only a handful of programs. Today going through an accelerator does not distinguish your startup. I mentor at a bunch of accelerators and have seen a disturbing trend: A lot of startups are going to multiple accelerators! This is a very bad idea. I’ve seen several startups “accelerator hop” or join multiple accelerators. The top reason I have been seeing is that a startup has gone through a regional accelerator in their home country and then wants to use an American accelerator to “enter the US market.” For example, let’s say you are startup CoolCo from Poland and you go through the PNA or Polish National Accelerator. You’ve given up 6% for somewhere between $20k and $75k. After a few months at PNA you “graduate” at Demo Day with some initial traction and a small amount of revenue, but don’t necessarily have much opportunity to raise money in Poland. You know that your core customers are in the United States, so you need to enter the US market. PNA does its best to introduce you to some mentors and connections in the US, but you are pretty much on your own. So you decide to go to another accelerator, in the US, in order to enter the US market. The problem with this model is two fold. The first is that you get diminishing returns going through a second accelerator. You already spent the time working on the “product market fit” working with mentors and learning the “lean startup.” You should be an expert by now. :) All those mentor meetings, Friday check-ins, demo day pitch practice, will be educational, but a distraction. That is time you could be actually working on your startup, specifically hustling to enter the US market! Ironically joining an American accelerator will slow down your US entry! In addition, the accelerator in the US, while located in the US, is not going to help you break into the US market, just like being an exchange student in Italy won’t make you an Italian citizen. US accelerators do not focus on US market entry, so you are better off hustling and entering the US market on your own. The second problem comes down to economics. Your second accelerator will take another 6% stake for somewhere between $20k and $75k. So you will have raised approximately $100k for somewhere between 10-12% of your company. Your next step is to try and raise a Seed round and now your have given up too much equity in order to get the seed round. Another reason I am seeing in the accelerator hopping phenomena is funding. Some startups join one accelerator, can’t raise a seed round after Demo Day, and then join another accelerator, hoping that the second accelerator will introduce them to more investors. They fall in the same equity trap as CoolCo above. The problem is that no accelerator is going to magically change your chances of raising money in three months, only traction and customers will do that. You are better off not wasting the time in another program and spending all of your energy getting customers. Paying customers leads to investment, not multiple accelerators. I understand that once you have graduated an accelerator your startup may not be ready for a seed round. In addition, you miss the focus and push that an accelerator gave you. One possible compromise is to join an incubator program. Incubators usually provide space, business services, and a very light mentorship program without taking any equity. They are typically run by government development funds or other non-profit programs and last between six months and a year. A handful of incubators will also provide access to some non-equity grant money. Incubators are not perfect, but can give you the final push your startup needs before doing a seed round without diluting your equity or wasting your time. Either way, don’t delay and go out and hustle! A lot of people misuse the term “MVP” or Minimum Viable Product. To be clear an MVP is not a beta, not a prototype, but rather an experiment designed to test your value proposition’s assumptions by measuring a behavior and learning from the results. Back in the day, Dropbox did an MVP as just a video and Buffer was just a landing page. Both were experiments to determine if Dropbox or Buffer should even exist. Instead of guessing and building prototypes, they build the simplest of things in order to measure a user’s behavior. Today startups are building functional prototypes and calling them MVPs. They are better off building something they can learn from. Typically the first MVP doesn’t even have to be anything on a device or computer. For example, I once advised a new travel startup that wanted to give you one click access to a daily itinerary based on a map. They assumed that people wanted a map with pin points on it and times to follow. I told them to go to tourist spots and give people real maps with real pin points circled and an analog itinerary to follow. That was an MVP, it was an experiment (map) that measured (how many as a percent of total) a user behavior (did they use the map or not). Let’s take a look at how to build a better MVP. The whole idea of an MVP is to measure an actual result against your expected result to prove or disprove your assumption. In order to do that you need data. The first place to start is to think about is your customer segment; you have to know who your target customers are going to be. Without knowing your exact segment (22-34 year old professional, urban women, single, living alone, earning over $75k), you won’t be able get the correct pool of users to test on. After you define your customer segment, you define your value proposition. Too many people think that their value proposition is just the solution to the problem they are solving. That is incorrect: your value proposition is the delta between the current solution or workaround to the problem people are currently using and your solution. You measure your value proposition in terms of how much better your solution is compared to the solutions that exist today. Let’s say you are solving a problem for buying movie tickets. Several solutions already exist; there are lots of web sites, apps, etc. Maybe your solution involves buying the tickets via SMS. Regardless, you have to think about what the alternatives to your solution are and compare them against that. One is simply buying the ticket at the box office. Here your alternative has value, but not tremendous value. Alternatively, let’s say you are developing a life saving cancer drug. The alternative without your solution could be death. In this case your solution would be incredibly valuable. Underpinning your value proposition are your core assumptions. These are the things that would compel someone to buy your product or service. The job of the MVP is to test those underlying assumptions. The only way to successfully test those assumptions is by making a prediction of the result and comparing the behaviors that you measured up against your predictions. Your predictions should be based in fact, facts that would determine if you have a viable business or not. If you don’t make a prediction, then you will not have a way to determine success or failure of the MVP test. With a a CLV of $21 and a CAC of $25, you will lose $4 on each new customer you acquire. Or CLV ($21) - CAC ($25) = -$4. For your MVP test, you will need a higher conversion rate/lower CAC rate in order to make a profit. For the first MVP test make a prediction that the conversion rate will be 5%, bringing your CAC down to $20. Or CLV ($21) - CAC ($20) = $1. Let’s take 0.021%. This is an absolute failure, you can safely assume that your assumption is invalidated. Safest thing to do is declare the assumption invalid and go back to your value proposition and rethink it. If you have other assumptions associated with your value proposition, you can do some more MVP tests to determine if the entire value proposition is invalid or not. Chances are you will have to iterate your idea and value proposition some more. What to do if you are at 4.28%. Technically it is invalid since you need 5% conversion rate in order to make any money. Should you just give up and go home? No. You should try some new UX and new design or different language and run the test again. Don’t run the test without changing anything! If your future tests with minor changes are at or over 5%, then you can declare your assumptions valid and move on to test the next one. Let’s look at 17%. Woo-hoo, your assumptions are more than valid, you blew away your predictions. Verify that your test was fair and then declare your assumption valid and move on to test the next assumption. Thats all there is to it! Only by clearly defining what success is and basing those numbers in a business reality is an MVP useful. Anything else is just a beta.